ABC News.com: Poll Vault - ABC News guide to polls and public opinion. American Association for Public Opinion Research (AAPOR) - A leading association of public opinion and survey research professionals. American National Election Studies (NES) - Produces high quality data on voting, public opinion, and political participation that serve the research needs of social scientists, teachers, students, policy makers and journalists concerned with the theoretical and empirical foundations of mass politics in a democratic society. American Research Group - Polling results have been erratic and may indicate incompetance or contrived bias. Americans and the World - U.S. public opinion on international issues. BVA - Marketing and opinon polls, the 4th largest research agency in France. Edison Research - Edison Research conducts market research and exit polling, providing strategic information for businesses and media organizations worldwide. Edison Research has been the sole provider of exit poll information to the six major news organizations - ABC, CBS, CNN, FOX, NBC and the Associated Press - since 2003. Ekos - Conducts research across Canada and around the world. Field Research Corporation/Field Poll - Expertise in questionnaire design, survey data collection and specialized capabilities such as analysis for legal cases, expert testimony in court, and Hispanic and Asian-language interviewing. Independent and non-partisan media-sponsored public opinion news service. The Field Poll was established in 1947 as The California Poll by Mervin Field and has operated continuously as an independent, non-partisan, media-sponsored public opinion news service. Each year the poll covers a wide range of political and social topics examining California public opinion. Surveys are made at frequent intervals throughout the year. Continuing measures are made of voter support for leading political figures vying for major state and federal offices, job ratings of important political figures and reactions to significant political events. Voter awareness, understanding and predispositions of major campaign issues and salient statewide ballot propositions are also tracked over time. The Field Poll currently issues forty to fifty reports per year. Each report consists of 3-10 pages of text and statistical data, and includes a background section providing details about the interviewing method, sample size, question wording and other technical data. Also see Latest Poll / Poll Archive and Field Poll Overview. Financial Trust Index - The Chicago Booth/Kellogg School Financial Trust Index is a measure of confidence Americans have in the private institutions in which they can invest their money. It is calculated quarterly on a sample of 1,000 American adults (see representative sample). Gallup - One of the world's largest management consulting firms. Gallup's core expertise is in measuring and understanding human attitudes and behavior. Gallup also conducts The Gallup Poll, a leading source of public opinion since 1935. See Resources page. Greenberg Quinlan Rosner Research, Inc. (GQR) - Public opinon and strategic research for companies, political campaigns, and issue organizations worldwide. Institute for Public Policy and Social Research (IPPSR) - Applies research to public policy issues and builds problem-solving relationships between the academic and policy-maker communities. Institute for Research in Social Science (IRSS)/Odum Institute - The Odum Institute maintains one of the oldest and largest archives of machine-readable data in the U.S. Its Louis Harris Data Center is the exclusive national repository for Louis Harris public opinion data. The Institute has an extensive collection of U.S. Census data, including one of the most complete holdings for 1970 Census files. The Institute maintains a web-based computer-searchable catalog of the more than 2,800 studies and series in its data holdings. Inter-university Consortium for Political and Social Research (ICPSR) - ICPSR maintains and provides access to a vast archive of social science data for research and instruction, and offers training in quantitative methods to facilitate effective data use. Ipsos North America - A leading global survey-based market research group. offering offers a full suite of research services, guided by industry experts and bolstered by advanced analytics and methodologies in advertising, marketing, public opinion, media and customer loyalty research, as well as forecasting and modeling. Also see the Ipsos News & Polls. Kaiser Polls - Key tracking information on public opinion about health care topics to journalists, policymakers and the general public. Knowledge Networks - Product development, media planning, public opinion research consumer information company. Latinobarómetro Corporation - A private non-profit organization, based in Santiago, Chile, that is responsible for carrying out the Latinobarómetro survey and for distributing the data. Latinobarómetro is an annual public opinion survey that involves some 19,000 interviews in 18 Latin American countries, representing more than 400 million inhabitants. Levada-Center - A Russian non-governmental research organization. The Center regularly conducts sociological research. Levada-Center is one of the largest Russian centers in the field. Los Angeles Times Poll - National issues and California politics. Marist Poll - A survey research center at Marist College providing information on elections, policy, and popular issues for the public. Mitofsky International - Election and public opinion research. National Council on Public Polls (NCPP) - An association of polling organizations established in 1969. 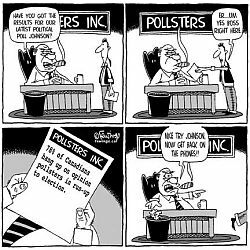 Its mission is to set the highest professional standards for public opinion pollsters, and to advance the understanding, among politicians, the media and general public, of how polls are conducted and how to interpret poll results. New America Media - Through its quarterly multilingual polling initiative, NAM is driving home the point that to track public opinion in the United States without accessing immigrant, ethnic and non-English speaking communities is to discount the voice of a large segment of the population. In states like California where minority populations have become the new majority, accessing these opinions is more vital than ever. New York Times/CBS Poll - U.S. national issues. Opinion Research Business (ORB) - Based in London, with experience in global market research in over 65 countries and a dedicated team of market research professionals. Peter D. Hart Research Associates - One of the leading survey research firms in the United States. Pew Research Center - An independent opinion research group, sponsored by The Pew Charitable Trusts, that studies public attitudes toward the press, politics and public policy issues. Political Arithmetick (Charles H. Franklin) - Analysis and graphing of data on a variety of political topics. Polling Company - A full-service market research, public affairs and political consulting firm headquartered in Washington D.C.
PollingReport - A nonpartisan resource on trends in American public opinion. Angus Reid - A leader in the use of the Internet to carry out public opinion polls. FiveThirtyEight - Electoral projections; analysis of polling and political data. Also see @NateSilver and @FiveThirtyEight. Gallup: Election 2012 - Gallup's polling and analyses. HuffPost Pollster - Pollster and polling news. Rasmussen Reports - Polling on the U.S. Presidential race, updating its Presidential Tracking Poll each day at noon Eastern. SurveyMonkey - Create any type of survey—from simple to sophisticated—with SurveyMonkey's powerful and easy-to-use survey builder. The Democratic Strategist (TDS) - Research on public attitudes and social trends with extended, ongoing discussion of long-range Democratic political strategy. Princeton Survey Research Associates (PSRA) - Conducts surveys by telephone, mail, personal interview and online worldwide, including in the United States, Europe, South and Central America, Africa and Asia. Princeton Survey Research Center - Poll and survey findings and data. Foundations, government sources, statistical, demographic, and social science archives. Survey research centers, market research, associations and organizations. Program on International Policy Attitudes (PIPA) - Carries out research on public attitudes on international issues by conducting nationwide polls, focus groups and comprehensive reviews of polling conducted by other organizations. Public Agenda Online - Source for public opinion and policy analysis. Public Citizen Litigation Group FOIA Assistance - Provides comprehensive assistance to other non-profit organizations seeking government-held information. The Clinic provides direct litigation assistance to public interest organizations, particularly those that have substantive expertise in their area but lack substantial FOIA litigation experience. The Clinic also collects and analyzes information about recent FOIA litigation conducted by public interest organizations to identify and address common FOIA problems. Public Opinion Quarterly - University of Chicago Press. A leading interdisciplinary journal for practitioners and academicians studying the development and role of communication research, current public opinion, as well as the theories and methods underlying opinion research. Such methods include survey validity, questionnaire construction, interviewing and interviewers, sampling strategy, mode of administration, and analytic approaches. Public Policy Institute of California (PPIC) - In April 1998, the institute launched the PPIC Statewide Survey with the purpose of providing independent, objective, nonpartisan information on the social, economic, and political attitudes and policy preferences underlying ballot choices in statewide races and citizens' initiatives. Public Policy Polling (PPP) - Employs Interactive Voice Response (IVR) technology to poll quickly, cost-effectively, accurately. Conducts surveys for politicians and political organizations, unions, consultants, and businesses. View our client list. In addition to surveys, PPP provides automated message delivery services (robocalls). Quinnipiac University Polling Institute - Regularly surveys residents in Connecticut, New York, New Jersey, Pennsylvania and nationwide about political races, state and national elections, and issues of public concern, such as schools, taxes, transportation, municipal services, and the environment. RealClearPolitics: Polls - Poll data, poll averages. Retro Poll - Designs and performs opinion polls that look at the relationship between public knowledge and public opinion. For now Retro Poll is limiting its subjects to highly controversial issues of national and international importance, such as the War on Terrorism, the Middle East, the Death Penalty, and a National Health Care system. Roper Center for Public Opinion Research - Curbing the distortion of the public's voice as it is expressed through polls, and affirming responsible and imaginative applications of good survey work, are core tenets of the Roper Center's mission. Survey data housed in the Center's extensive archive are made accessible to academic and policy researchers, the press, business, and others who are interested in poll findings. Survation - Market research firm, data analysis. TNS - Market information and polling services. Wall Street Journal/NBC News Poll - Polls on U.S. national issues. Washington Post: Poll Vault - A searchable database and story archive of Washington Post polls and analysis. Also see, Latest Washington Post Poll. and the Data Directory, a guide to public opinion data published on the Internet by nonpartisan organizations. World Public Opinion (WPO) - The Program on International Policy Attitudes (PIPA) launched WorldPublicOpinion.org (WPO) in January 2006 to provide a source of in-depth information and analysis on public opinion from around the world on international issues. YouGov - Global public opinion and data company. This webpage last updated on Wednesday, August 8, 2018 7:07 PM.